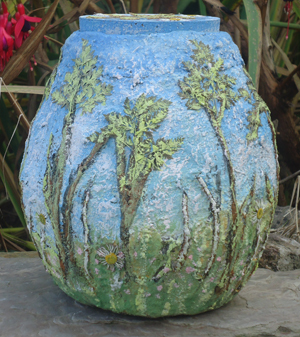 Inspired by the hills and woods of my home county Devon this urn has tree shapes in relief on the surface. It is decorated with a mix of chalk earth pigments, paint, leaves and wild flowers. The lid is adorned with a collection of pressed daisies. For home display I will cover the surface with a matt varnish to seal the leaves and wildflowers in place. If being interred, this varnish coat will not be needed.